Design for All as basic concept for environmental planningThe tense financial situation common to all NGO´ s on international and national level was reflected in the deliberations and will further on be tabled on the agenda. 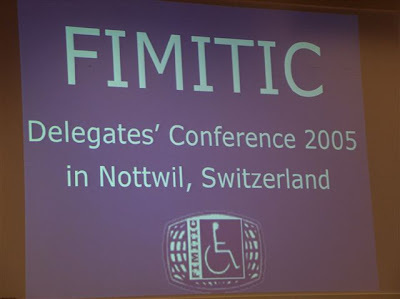 The delegates had the opportunity to represent their most different views and those of their organizations, ensuring that FIMITIC is driven "by members, for members" and can represent the perspective of people with physical disability internationally beyond the incessant financial hindrances. The FIMITIC Office and seat of FIMITIC at present remain unchanged in Bonn, Germany, so the indispensable socio-political work of FIMITIC in the disability field will continue without still stand. We believe into the strength of the FIMITIC members´ potential and their political will, but also into the traditionally based common spirit leading to a collective response and support as a both way action! The Executive Board expects the new role and strategy to have a strong impact on the FIMITIC´ s work also in future.